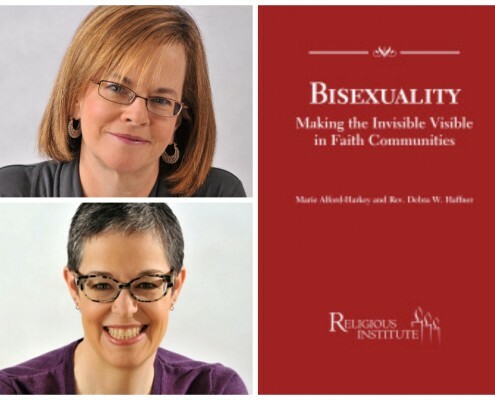 Debra and Marie will talk about their new book, Bisexuality: Making the Invisible Visible in Faith Communities. The Reverend Debra W. Haffner is Co-founder and President of the Religious Institute. An ordained Unitarian Universalist minister, she is also the endorsed community minister with the Unitarian Church in Westport, CT. Rev. Haffner was the chief executive officer of SIECUS, the Sexuality Information and Education Council of the United States, from 1988 through 2000. She is the author of several guides and books on sexuality, as well as books on parenting. Rev. Haffner has a Master of Divinity degree from Union Theological Seminary, a Master of Public Health degree from Yale University School of Medicine, and an undergraduate degree from Wesleyan University. In 1996-97, she was a Research Fellow at the Yale Divinity School. She has been a visiting professor at Union Theological Seminary, Pacific School of Religion, and Yale Divinity School. Ms. Marie Alford-Harkey is Deputy Director of the Religious Institute. An educator with twenty years of classroom experience, she holds a Master in Divinity degree from the Episcopal Divinity School and is an aspirant for Holy Orders in the Episcopal Diocese of Connecticut. Ms. Alford-Harkey is a New England coordinator for Integrity USA and a board member of Integrity Connecticut, an organization that works for full inclusion of LGBT people in Episcopal faith communities. Ms. Alford-Harkey has led workshops at Union Theological Seminary and Hebrew Union College-Jewish Institute of Religion in New York. Ms. Alford-Harkey teaches, speaks, and preaches on faith and sexuality issues in diverse contexts. Bisexuality: Making the Invisible Visible in Faith Communities (Religious Institute, 2014) particularly the Introduction, pp 1- 3; “Healing the Suffering,” pp. 22-24; “Theological Connections,” pp. 30-31. WATER will send a PDF of these chapters for the private use of those who register. Feel free to email Cathy at waterstaff@hers.com if you have any trouble registering or need more information. Thank you!